If not lawn, what? That is the question. And what’s wrong with lawns anyway? Lawns have attributes. They feel good beneath bare feet, providing tactile pleasure. They are visually pleasurable, providing a calming sea of green. They provide a surface for croquet and other lawn games and a safe play area for children. From a landscape design standpoint, they offer an expanse from which the larger landscape can be appreciated. They are not claustrophobic; they feel casual and relaxed. In addition to their attributes, there are several reasons to consider eliminating or at least reducing the amount of lawn in your landscape. Mowing is time-consuming and requires equipment that needs to be maintained and stored. Most mowers create noise and air pollution. Hiring a lawn maintenance company is expensive. Environmentally harmful chemicals are often employed in an effort to keep a lawn looking good. As a monoculture, lawns offer little to birds, butterflies, and other wildlife and beneficial insects that are drawn to a more diverse landscape. Fortunately, there are good alternatives to lawns. If you want the expansiveness of a lawn without the drawbacks consider a no-mow alternative, such as High Country Gardens Low Work and Water Dwarf Fescue Grass Seed™ or Wildflower Farm Eco-Lawn™, which is another fescue seed mix. These seed mixes entail less (or no) mowing, use less water, and use little (or no) fertilizer. They are quick to germinate and reputedly grow in full sun, part shade, and even deep shade. Once established the slow-growing, deeply rooted turf is very drought tolerant. It develops a deep green grass color and can be mowed like a regular lawn or left un-mowed for a free-flowing, carpet-like effect. These seed mixes can be expensive to buy and install, but if they obviate mowing, the higher upfront investment might balance out over time. 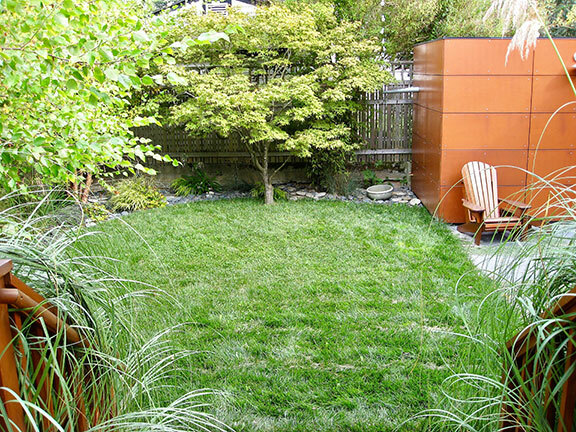 As for maintenance, Seattle landscape designer Christie Coxley of C2 Urban Garden Design recommends annual turf grass maintenance, including aerating, thatching, and overseeding. Coxley has used the Low Work and Water Dwarf Fescue Grass Seed™ primarily in part-sun situations, mostly morning sun and afternoon shade. This lawn of High Country Gardens Low Work and Water Dwarf Fescue Grass Seed™ has been in place for over 10 years and is enjoyed by the entire family, including kids and canine. "Lawns" of Wildflower Farm Eco-Lawn™ have been in place for over five years. The turf on the left (which includes the driveway) is mowed regularly while that in the backyard (right) is mowed infrequently; the results have been positive for both applications. 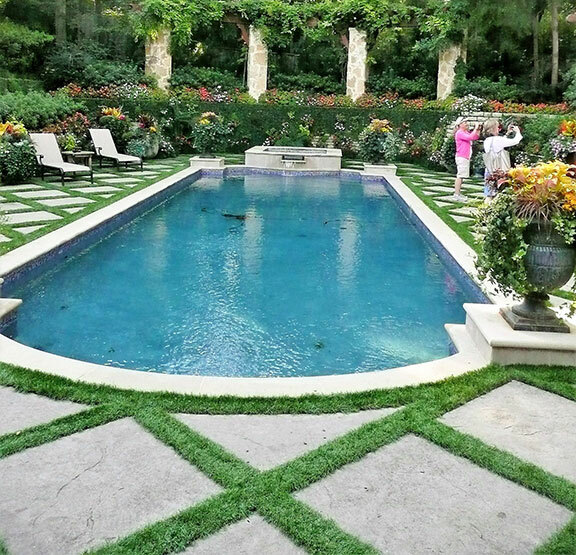 "Fake" lawns can be a hard sell to landscape design clients, but there are times when they are worth considering. Watering, mowing, maintenance, pet damage, turf disease, insect problems, and muddy areas are virtually eliminated. Some water districts, especially in arid regions, offer rebates for the use of artificial turf. Perhaps you desire a small patch of green but dread lawn maintenance and expense. Synthetic turf is useful for putting greens, checkerboard squares, Bocce ball courts, or between pavers. Some products are manufactured specifically for use by dogs, and of course, the dog "spots" common on real lawns are not an issue with artificial turf. Several products are available locally. Synthetic turf from System Pavers (SP Turf®) is marketed as an eco-friendly grass alternative to traditional lawns and putting greens. It has been used in professional sporting arenas where low maintenance and attractive appearance are essential. It looks and feels as good as the real thing, and doesn’t require costly and labor-intensive upkeep. It does not absorb animal waste or other external elements, so pet-friendly cleaning products are recommended to alleviate odors. Veterinarians and pet supply stores sell enzymes that can break down pet waste. ForEver Lawn™ has six different synthetic lawn categories, including four options for landscapes ("traditional" lawns), three types of K9Grass (for dogs), and several alternatives for sports and play. 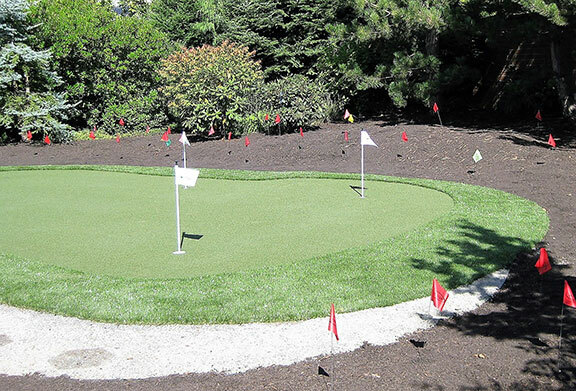 Designer Vanessa Gardner Nagel, FAPLD, has used SynLawn™ for a putting green. She thought the lawn looked real, but wishes it contained more post-consumer recycled content. In this application, synthetic lawn softens the paving and is virtually maintenance free. 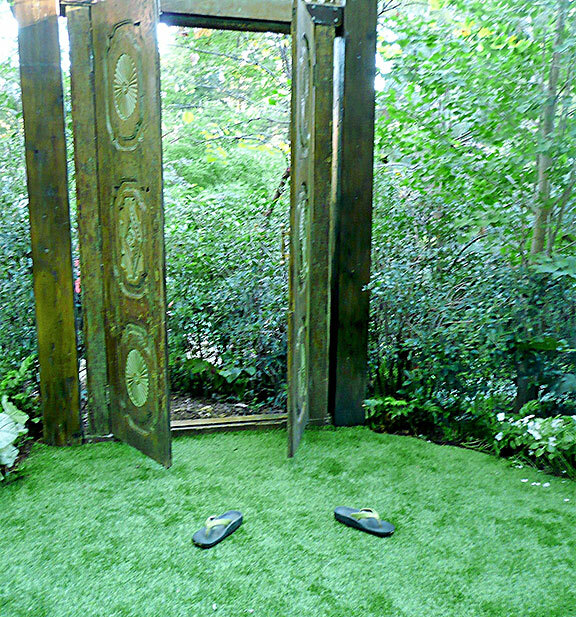 Artificial turf provides a "lawn" area from which the surrounding plantings and other garden elements can be appreciated; it also passes the "barefoot" test, feeling cool underfoot in this shady Dallas garden. Newly installed SynLawn™ putting green. If total lawn withdrawal is too extreme or painful, consider reducing your lawn area. How much lawn do you really need? Some lawns occupy so much real estate that it is reasonable to wonder what their purpose might be. Patios provide far more functional surfaces for dining and relaxing than do lawn areas, and furniture does not need to be moved for mowing. Smaller lawn areas should meet the needs and aesthetic preferences of most homeowners, whether it’s for children’s play or lawn sports, or to provide space from which to appreciate the larger landscape. Odds are you will enjoy what replaces your lawn—whether it be plantings, patios, or paths, etc.-more than you currently enjoy your lawn. You will also be able to breathe more easily, no longer feeling oppressed by the endless maintenance, troubleshooting, and expense of a large lawn. If you are uncertain how to begin eliminating lawn and transforming your landscape, contact a landscape designer for assistance.